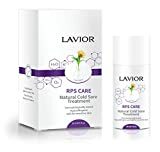 LAVIOR RPS-CARE is a clinically proven natural topical product that treats herpes (herpes simplex virus type 1), lip or fever blisters and cold sores. Our proprietary formula speeds up the healing process and helps to stop the spread of blisters. It is good for clearing cold sores and relieving cold sore symptoms like tingling, itching, discomfort. This extra strength ointment works on even the most challenging herpes outbreaks.